The process for installation can be done relatively quickly, saving labor costs. 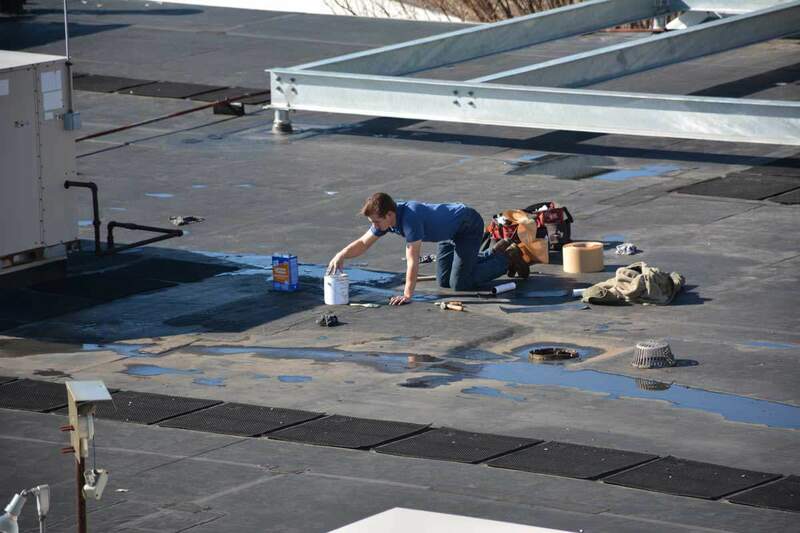 Although there is a more durable, two-ply system available, roofing contractors will install the EPDM, single-ply system because they know it well. The sales appeal of EPDM is that it is flexible and it comes in 8′ to 20′ wide rolls which means fewer seams. EPDM does not require expensive tools for installation. Although contractors choose to install an EPDM Rubber Roofing system, there is a more durable, two-ply system at a comparable cost. However, this method involves more skilled technicians and tools but doubles the life expectancy of the roof. It has been our experience when contracted to repair a roof, which some leaks begin as soon as 3-10 years after first being installed. Some of these EPDM roofs had signs of wear and tear due to foot traffic. Others had areas that had become brittle from harmful UV ray exposure. Most showed. However, that seems failed when the EPDM adhesives lost bonding properties, which has been addressed by manufacturers at least five times over the last 40 years. An EPDM rubber roof repairs are possible if the surface preparation is done carefully by experienced roofing technicians. Beware of suggestions that a replacement is needed, instead, find the qualified professional, who has the know-how, for finding the source of leaks and making the necessary repairs. Otherwise, you may incline to accept the sale of another, new EPDM single-ply rubber roofing system. When should an EPDM roof be repaired or replaced? The rule of thumb is two-fold: If the EPDM rubber roof was installed correctly and is less than ten years old, and when the cost of the repairs are less than 15% than the cost of replacement, a fix, rather than an alternative is the appropriate solution. Finding a roofing contractor should begin with knowing what type of roof you have and what type you need. If your roof needs repairs, it is in your best interests to find the contractor that specializes in the system you currently have. If you are considering replacing your roof, research different types of roofing systems and the life expectancy of each. Then locate a reputable contractor who specializes in the system that interests you. Develop a working relationship with the contractor, based on the information and advice you need, to make the best decision for your roofing needs. Whether your roof needs to be repaired or replaced, locating random roofing contractors to provide estimates, is not in your best interests. You may tend to compare the estimates and decide on the contractor who provides the “best” one. The “best” estimate may not take into consideration the reputation of the roofing company, the experience of the crew, but most importantly, the type of roofing system, in which they specialize. The image is about us repairing an EPDM Rubber roof in Westport Connecticut. This is a common thing to do. Once the seams starting to separate on an EPDM Rubber Roof, then there is no end to the repairs.